Check out the new Liberty Fire Co. Station 4 website over at http://www.libertyfireco.com and be sure to sign the guestbook. September 19, 2012 – At 10:25 Stations 1 & 4 were dispatched to the area of 33 South Shoe String Lane, South Manheim Township for a vehicle accident with unknown injuries. Chief 722 was the first to arrive on scene and found a utility van on its side, with no injuries or fluids down. Engine 737 assisted with traffic control until being placed available by Chief 722. September 18, 2012 – At 17:20 Stations 1 & 4 were dispatched to the intersection of Parkway Avenue and West Main Street for a vehicle accident with injuries. Crews arrived on scene to find a head-on collision with one patient seriously injured. Crews from Station 1 & 4 assisted EMS with patient removal from the vehicle and secured the utilities on both vehicles. EMS then requested an aeromedical to fly 1 patient. Chief 723 (Motko) advised SCCC to dispatch Station 2 to “the island” to handle the landing zone. Crews from Station 2 setup a secure area for PennStar 4 to land and assisted with patient transport to the bird. All SHFD units were on scene for approximately 45 minutes. September 18, 2012 – At 09:32 Stations 2 & 4 were dispatched to 1000 Clamtown Road, West Penn Township to assist at the scene of a working Structure Fire. Engine 732 and Squad 739 responded on the call. Manpower from both companies were used for overhaul and Squad 739 used its cascade to provide air. All SHFD units were on-scene for approximately 2 hours. September 7, 2012 – At 10:57 the SHFD was dispatched to 150 Manheim Road, North Manheim Township for a possible electrical fire inside a residence. Crews arrived and found an electrical fire in a wall had been extinguished by persons working on the house. Crews used PPV fans to ventilate the structure and disconnected the power. 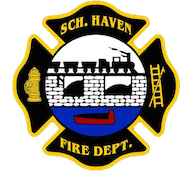 October 1, 2012 – At 16:15 The Schuylkill Haven Rapid Intervention Team was dispatched to 1342 West Norwegian Street, Pottsville City for for a working structure fire. Crews arrived on scene and staged on side A of the structure as fire personnel battled the blaze and conducted overhaul operations. Chief 722 (Sattizahn) had command and all units were on scene for approximately 1 hour. September 30, 2012 – At 15:23 Stations 1 & 2 were dispatched to 928 East Main Street for a tractor trailer leaking fluids. Chief 730 (Reed) arrived on-scene and found a tractor trailer had ruptured a saddle tank and was leaking a large amount of diesel fuel onto the roadway. Chief 730 then requested additional resources and manpower adding Station 4 to the call. Crews used a containment pool and a large amounts absorbent material to control the spill. A HazMat cleanup team was also dispatched to the scene to remove the remaining materials from the roadway. Chief 730 had command. September 28, 2012 – At 17:54 Stations 2 & 4 were dispatched to West Main and Columbia Streets in the borough for a vehicle leaking fluids. Upon arrival crews found minor injuries and fluids down. Fire personnel secured the fluids leaking from the vehicles and assisted EMS with patient care. All units were on scene for approximately 30 minutes. September 23, 2012 – Approximately 40 minutes after the SHFD Dive Team was dispatched to Berks County, at 15:52 Stations 2 & 4 were dispatched to the area of 340 Berne Drive for a Tree Down. Crews from Engine 732 and Engine 737 remove the tree from the roadway and were placed available by Chief 720. September 23, 2012 – At 14:32 the Schuylkill Haven Fire Department Dive Team was dispatched to Lake Ontelaunee, Maidencreek Township in Berks County for a Water Rescue/Recovery. Squad 734, Squad 739 and other personnel made the trip along with 2 inflatable boats and a flat bottom aluminum boat. Upon arrival the 2 inflatable boats were deployed into the water with teams of divers, and one boat equipped with Side Scan Sonar. Divers searched the water and used the Side Scan Sonar but found nothing. Northern Berks Regional Police then called off the search after nothing was found. Captain 734 was in command. The SHFD Dive Team was on-scene for approximately 3.5 hours.